tradition in polymer chemistry and polymer processing capabilities. physical entrapment during curing or through an in-line extrusion process. composite materials for use in a variety of industrial applications. The MRI offers extensive testing facilities of particular interest to companies in polymer, medical & pharma sectors. Detailed testing and analysis can contribute significantly in troubleshooting processing problems, comparative testing of products & product quality integrity. The MRI operates within a fully traceable quality system including equipment calibration, project tracking and machine maintenance. Biomedical polymer research at the MRI is underpinned by a strong tradition in polymer chemistry and polymer processing capabilities. Building on these foundations, a wide variety of materials and manufacturing methods are currently being developed. 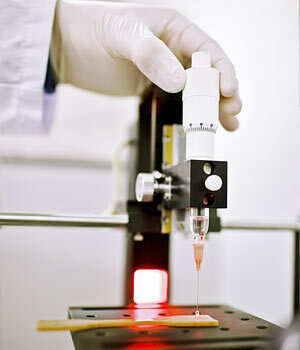 Bone regeneration, Peripheral nerve repair, Biodegradable stents, Wound healing devices, Lubricious hydrophilic coatings. Bone is a highly complex tissue, which undergoes microfracture and repair through everyday loading. It is this ability to repair and regenerate its structure that enables bone to spontaneously repair itself following injury without the formation of scar tissue. However, 5-10% of all fractures do not heal in the desired manner. This can lead to the need for surgical intervention where the most common treatment is a bone grafting procedure. There are an estimated 2.2 million such procedures globally each year, which makes bone the second most transplanted tissue after blood. These procedures have inherent disadvantages which gives rise to a great deal of research in this area to develop viable bone graft substitute materials. Peripheral nerve injuries may occur as a result of trauma, infection, or genetic disorders, resulting in pain, sensory loss, muscle weakness and problems with movement. It is estimated that over 700,000 surgical procedures are conducted in the US alone very year, and the annual value of the market is over $700 M. At present, there is no commercially available polymeric device that equals the performance of the autograft, which is the current gold standard. To address this unmet clinical need, the peripheral nerve repair biomaterials programme at the MRI seeks to develop novel polymeric biomaterials and manufacturing methods for the creation of the next generation of medical implants for peripheral nerve repair applications. The MRI has a strong track record in the field of coatings for catheters, development of drug eluting stents and the development of biodegradable polymer blends with tailored degradation profiles and mechanical properties. This knowledge is combined to produce solutions for use in the field of biodegradable stents, where polymers and composites with specific mechanical properties and degradation profiles are required. The development of novel drug delivery systems is an extremely active area of the biomedical industry, and there are obvious economic and therapeutic advantages to improving the manner in which drugs are administered. Polymer drug delivery systems have been an area of core competence within AIT for over 20 years, leading to numerous publications in peer-reviewed journals, as well as important collaborations with leading higher education and industry partners. Smart Polymers are a new generation of materials which exhibit extraordinary properties. These types of polymers can respond sharply to small changes in physical or chemical conditions with relatively large phase or property changes. Arguable the greatest potential of smart polymers lays in the area of targeted drug delivery. With clinical applications beginning to emerge it is a very exciting time for smart polymer materials research. The Materials Research Institute has unrivalled polymer processing capabilities in the Irish setting. It carries equipment for injection moulding, extrusion, melt spinning, compounding, vacuum forming, compression moulding and blow moulding. 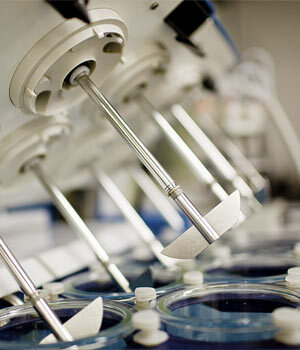 The Materials Research Institute is home to the Applied Polymer Technologies (APT) Technology Gateway. APT is part of the Technology Gateway Network, a nationwide resource for industry based in the IoTs delivering solutions on near to market problems for industrial partners. The MRI specializes in the development of innovative thermoplastic composite materials for use in a variety of industrial applications. Polymer composites consist of a matrix polymer material with a reinforcing or non-reinforcing filler dispersed throughout. The matrix polymer acts to provide protection to the reinforcement material from both chemical and environmental attack; bonding to the reinforcement to permit transfer of load; and to hold the reinforcement in a fixed orientation. Our research encompasses both fibrous and particulate reinforcement, with a focus on basalt fibre, nanoclay and halloysite tubes. 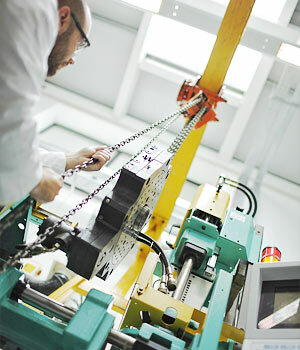 The MRI offers contract based analytical and design services through its Centre for Industrial Services and Design. Click below for more information an CISD. The Applied Polymer Technologies centre at the MRI is a part of the Enterprise Ireland funded Technology Gateway network. It is a national resource for the polymer sector in Ireland.